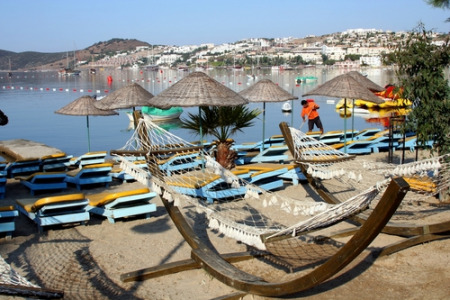 Bitez holidays take you to a resort on Turkey's Bodrum Peninsula. It is the perfect destination for those seeking respite from busy lives. Located near Gumbet and Bodrum, it contrasts starkly with their lively atmosphere. With a sand and shingle beach, Bitez is a pretty resort framed by verdant hills. Although a relaxed resort, it has fairly wide appeal and is a very popular choice with families and couples of all ages. The good provision of water sports, particularly wind surfing and sailing, is an added attraction. With low cost airlines flying from many regional airports, the journey to Bitez has never been easier. The season begins in early spring and ends in late autumn with temperatures rising into the mid-thirties at the height of the season. You are guaranteed day after day of cloudless skies. A wide range of accommodation caters for all budgets and all offer high standards of comfort with all modern amenities. You are assured of a warm welcome and service is excellent. Bitez restaurants provide for all tastes and you'll find dining out is comparatively cheap. Nightlife reflects the clientele and is very low key. If you enjoy livelier evenings, take a taxi to Bodrum where you can party into the early hours. Bitez shopping is limited but since you are so close to Bodrum, this is of no concern. The town is worth visiting in its own right as there are many ancient buildings including the medieval castle. Another popular excursion are the Roman ruins of Ephesus, second only to Pompeii with their depiction of Roman Life. Search for your cheap Bitez holiday today. If a Bitez holiday appeals but you find the thought of trawling through web page after web page looking for the best deal more than a little arduous, try our simple search facility. You'll find over three dozen travel companies, including leading brands, competing for your custom. It is simple to use, and remember, competition brings out the best bargains. Our search facility enables you to see, at a glance, the Bitez holiday that is the cheapest, and the one that offers the best value for money. It couldn't be easier. All you have to do to secure the holiday is make a phone call. As offers change daily, in order to avoid disappointment, you should ring today.